Powers: Itzamna possibly possesses greater powers than any other Mexican god. He has superhuman strength (probably Class 85), stamina, vitality and resistance to injury. He also has the ability to tap into and manipulate mystical energies on the level of Zeus, Odin or Osiris. Physical Description: Itzamna resembles an ordinary human being except for his extraordinary size, stature and stamina. History: (Mexican Myth) - Itzamna is one of the older Mayan gods of Ancient Mexico. Possibly the eldest of this first generation of gods, he served at the head of the Mayan pantheon until around 800 AD when the Aztec Empire first began to grow in importance and began assimilating all the smaller races of the Yucatan. Tezcatlipoca took the head of the newer pantheon out of the ashes of the Mayan race and many of the Mayan gods served roles in both cultures. Quetzalcoatl, the wind-god, however, supported Itzamna as Tezcatlipoca demanded blood sacrifices from the Aztecs. Tezcatlipoca hated the young god for his loyalties to older heritage and ended up embarrassing him into exile. Itzamna and his few supporters lived in the dimension of Xibalba, a world which mythologically existed underground, but this may actually be the location of its portals. Tezcatlipoca and the Aztec Gods presided in Teotihuacan, The City of the Gods, which formerly existed near Tenochitlan (the site of modern day Mexico City) before being moved to another dimension. (Thor I#300, ) - Itzamna met with Odin to discuss the threat of the Celestials. When the Asgardians lost their lives to the alien invasion, Thor went to Xibalba to petition a portion of the life energies to revive the Norse gods. Sensing a debt had been paid to his realm, Itzamna offered Thor the necessary energies. (Thor Annual#10 - BTS) - Under the threat of Demogorge the God Eater, Odin asked Itzamna for a warrior to fight the entity alongside Thor. Itzamna sent Quetzalcoatl. (Infinity Gauntlet#2) - Possibly having come to a truce, Itzamna and Tezcatlipoca came together with the other godheads over the threat of Thanos wielding the Infinity Gauntlet. Briefly stranded in Asgard, he assisted Odin to preserve that realm as Adam Warlock led Earth's heroes against Thanos. (Secret Warriors#10) - Itzamna was present when Phobos (Alexander Aaron), son of Ares, was found worthy by the Council of Godheads to be a god. Comments: Comments: Adapted by Jim Starlin & George Perez. Gaea admitted to being Coatlique in Thor I#301. 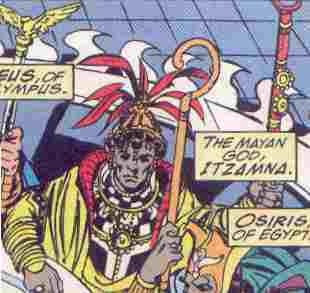 Several godheads previously seen in the Marvel Universe and known from myth do not appear in Infinity Gauntlet #2. Possibly erased by the power of Thanos and the Infinity Gems, these names include Anu (Mesopotamian), Yu Huang (Chinese), Izanagi, Takamimusubi (both Japanese), Viracocha (Incan), Ukko (Finnish) and Nyambe (African).